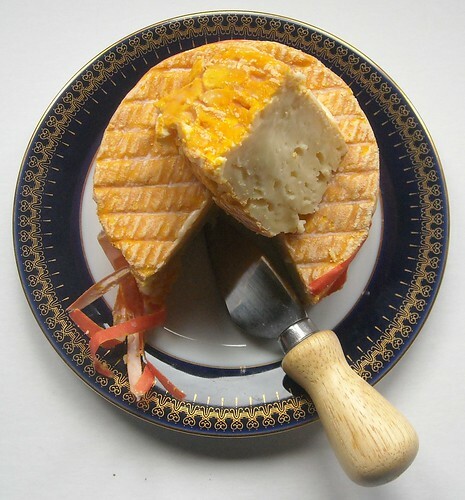 PDO Livarot Cheese, originally uploaded by JuliaBalbilla. Emmenthaler n Tangy and sometimes pungent; a Swiss cheese made from cow's milk and containing small holes. fontina n Tangy and semisoft; Italian cheese, made of cow's or sheep's milk. Camembert n Mellow creamy cheese of a golden color, made from cow's milk. Roquefort Strong cheese, veined with mold, made of sheep's milk in southern France. Stilton Very strong, rich, and waxy white cheese, veined with mold, made of cow's milk; English. Cheshire n Hard cheese, yellowish, orange, or white in color, made of cow's milk and similar to cheddar. mozzarella n Very mild, shite, semisoft Italian cheese. feta n Salty and aggressive; white brine-cured Greek cheese made from sheep's milk and/or goat's milk. Gouda n Mild, semisoft cheese made in Holland from cow's milk. raclette n Earthy semisoft cow's milk cheese made in France; usually served melted. chèvre Mild, fresh soft goat's milk cheese. Pecorino n Salty and mild; dry, hard Italian cheese made of sheep's milk. Limburger n Pungent soft white cow's milk cheese. manchego n Nutty and mild; firm sheep's milk cheese from Spain. Parmesan n Salty and mild; hard, dry variety of Italian cheese made from cow's milk.